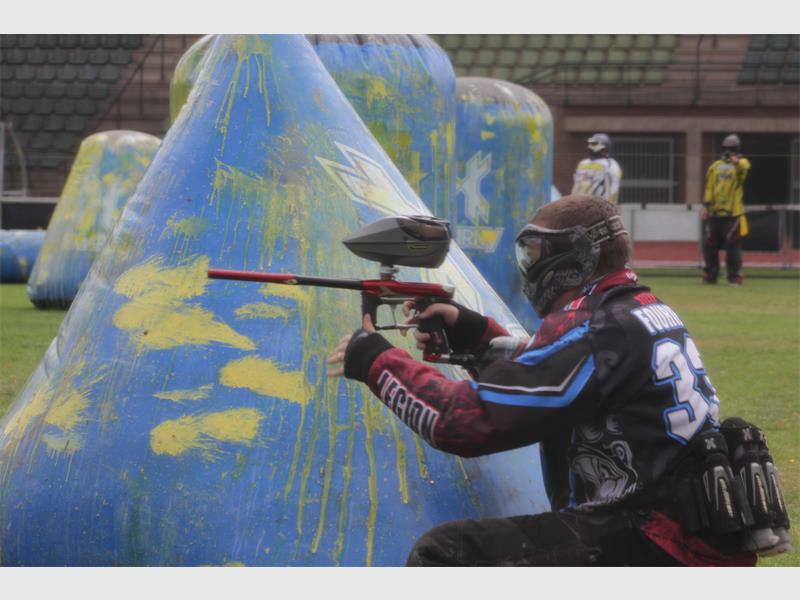 The Ruimsig Athletics Stadium was once again chosen to host this year’s Paintball Super Cup 2015. The three-day competition which started Friday had more than 60 teams from around the country participating in various divisions. Teams such as Roodepoort’s Wolverines and international teams such as BIOHAZE Berlin from Germany took part in the competition. The tournament has a race to two and race to three formats, which means the first team to get to two or three points, wins the match. Before the competition began, a beginners Clinic as well as Blades and Triggers Intermediate Clinic was presented by Blake Yarber. International referees CJ Traub and David Baker were present at the competition and made sure proceedings were in order. The competition started Friday morning with 3-man and 5-man teams participating in the preliminaries. On Sunday was the play-offs and finals. In the 5-man teams, Assala from Gabon took first place in Open Division category with Biohaze Berlin and Patriots GP taking second and third position respectively. In the Challengers division, Apocalypse were victorious with Coastal Legion and Aftermath securing second and third position. Dynamix took first place in the Championship Division ahead of Reaper who were in second position and Brutal Affliction finishing in third position. In Division 4, YDFC were the victors with Patriots and Working Class Heroes finishing in second and third position on the podium. In the 3-man team Beginners Division, the winners were XO Vigilantes. Second position went to PanGalacticGoggelBlasters while Mustangs finished in third position. Division 5 winners were Heroes Reloaded with TAG Legends and Death Watch Assault finishing in second and third position respectively. Patriots were the winners of Division 4 with Distortion and Critical taking the second and third spots on the podium.